The Automatically Save Workspace preference is enabled by default. Every time you add a view to your workspace, remove a toolbar or change a view’s width, these modifications are saved when you quit the application. If you do not want the system to save these modifications, disable the preference. This preference does not require you to restart the application. Refer to the Managing the Workspace section to learn more about this preference. The Focus on Mouse Enter preference is disabled by default. In Toon Boom Animate Pro, for the operations or keyboard shortcuts to work in the view in which you are working, the focus must be in that view. When the focus is on a particular view, a red rectangle appears around its frame. You must click in the view or on the view’s header for the focus to be done. If you enable the Focus On Mouse Enter preference, certain operations from the top menu may not be available since the view focus may change as you make your way to the top menu. In this case use keyboard shortcuts and quick access menus (right-click menus). You can expand the toolbar so that there are no nested toolsets in the toolbar. You will need to close Animate Pro and relaunch it for the new interface to be displayed. A default set of tools will appear in the toolbar. However, you can customize which tool icons appear in the toolbar to fit your own work pattern. Once you have enabled the Flat Tool Toolbar preference, you can customize the tools which appear in the toolbar. This means that you can change the default set of tools and replace the tools which you use less frequently with ones which are used more often. This customizing is done through the Toolbar Manager. To customize the toolbars refer to Toolbar Manager. The Levels of Undo preference determines the number of actions retained by the Undo list. By default, 50 actions are stored in the list. You can alter the number if you want to. The Colours preference allows you to modify the colours of the different user interface views and elements. For example, you can change the Camera view’s background colour from grey to white. Altering these preferences requires you to restart the application or to close a view and reopen it for the modifications to be applied. The Current View Border preference sets the colour of the frame around the workspace view you are currently using, also known as focus. By default, the colour is red. Click on the red colour swatch to select a new colour in the Colour Picker window. The Current View Border preference sets the colour of the frame around the workspace view you are currently using when editing a template from your library view. By default, the colour is green. Click on the green colour swatch to select a new colour in the Colour Picker window. Click on the Edit Colours button to open the Colours window. In the Colours window, you can modify any of the colours from the list. Most of the modifications will require you to restart the application or close the view and reopen it to see them. • To restore all of the default interface’s colours, click on the Restore All Defaults button. Click on any of the colour swatches and select a new colour from the Colour Picker window. • Onion Skin After: Changes the colour display of the next drawing when using the Onion Skin feature. • Onion Skin Before: Changes the colour display of the previous drawing when using the Onion Skin feature. 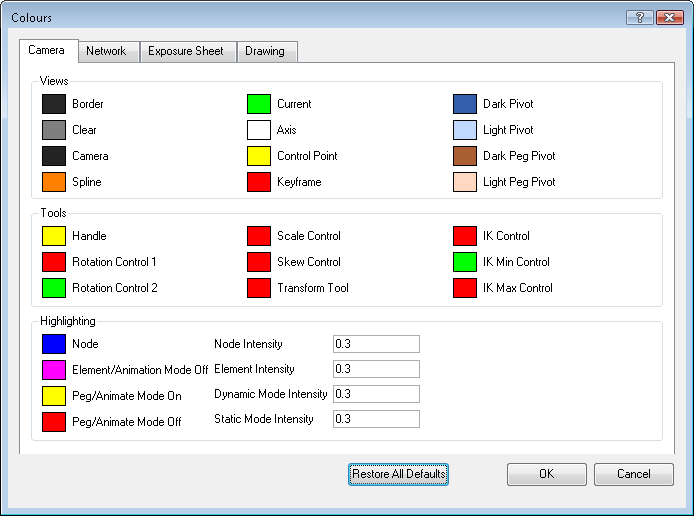 • Background: Changes the background colour of the Drawing and Model view. • Backlight: Changes the display colour of the Backlight option. • Grid: Changes the display colour of the grid when using the Show Grid option. • Colour View Background: Changes the background colour of the colour list area of the Colour view. • Colour Highlight Mode Opacity: Changes the opacity value of the washed out art when using the Highlight Selected Colour option. To restore all of the default interface’s colours, click on the Restore All Defaults button.